I have never been to the South. I have, however, lived in California my entire life and have traveled all over this gorgeous golden state. So ask me about the Golden Coast and I’ll tell you everything you need to know. Okay, so I’m a bad traveler. So what? My mom was always insistent that every child should go to Disneyland or “it’s child abuse”, and so we did. Many times. Memories and trips I wouldn’t have exchanged for anything or anywhere else in the world. But besides that? Nothing but a road trip (complete with car-sickness; ew) to Montana where we hit up Nevada, Utah, and Wyoming along the way, a brief trip to the Oregon Shakespeare Festival in the 8th grade, and a Christmas in Seattle. In other words, I’m kinda sorta awful at both saving money and traveling. Yay! However, despite my lack of culture, I do already know that I love the South. Southern food is one of my all-time favorites to cook and eat because it’s so hearty and comforting. Plus, have you heard of someone named Paula Deen? When a cuisine has that much butter involved, you know it’s good. They’re candies made with caramel, marshmallows, peanuts and chocolate and they’re awesome. Simple and delicious–what more can you ask for? I actually had my first Goo-Goo Cluster from the Dollar Store. Sometimes, our Dollar Store has some interesting candies and I picked it up one day eager to try it. I wasn’t disappointed, but I was inspired to create something with this to be all culturey and stuff. Enter Goo-Goo Cluster Brownie Bites. These are the most culturey thing on this blog, people. 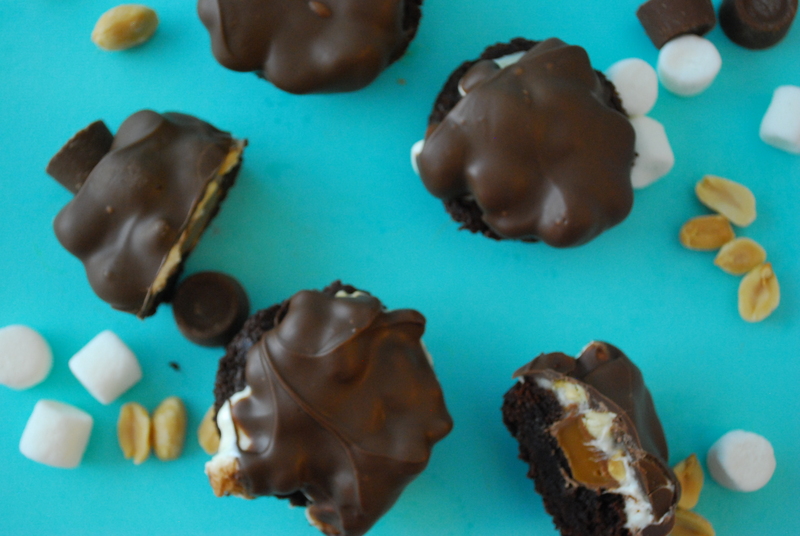 Brownie bites filled with Rolo’s and topped with a gooey marshmallow & peanut mixture that’s coated in a chocolate shell. Yeah, can’t get more cultural than that. So eat some and be a world traveler at home with me! 1. Preheat oven to 350 degrees F. Liberally grease 16 cavities in a mini muffin tin with cooking spray and set aside. 2. In a large bowl, prepare brownie mix per instructions. Portion the batter evenly among the greased cavities. Bake for approx. 10-12 minutes or until a toothpick inserted near the center comes out mostly clean. 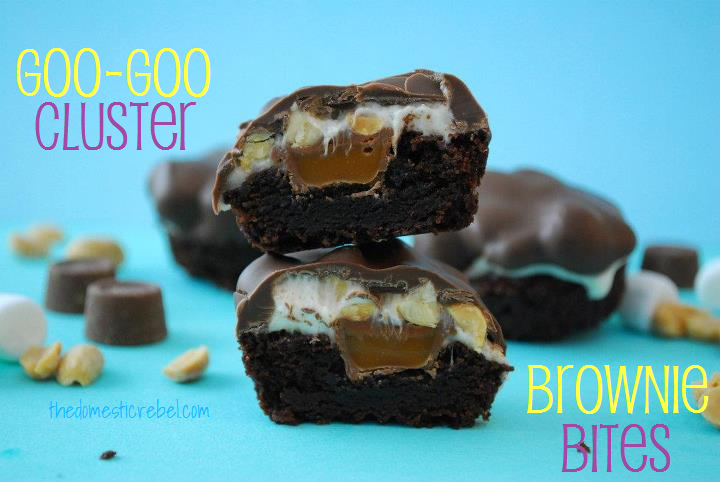 Cool for about 5 minutes, then gently push a Rolo candy into the top of each brownie cup. Allow the cups to cool 15 or so mins in the pan before carefully removing to a wire rack to finish cooling. 3. Meanwhile, in a medium saucepan, melt together the butter and marshmallows over medium-low heat, stirring constantly, for about 1-2 minutes. The marshmallows should not be completely melted. Immediately stir in the peanuts. 4. Working quickly, top each brownie cup with a heaping Tablespoon of marshmallow topping. Repeat process until all brownie bites are topped with filling. Pop the covered bites in the freezer for 5-10 mins. 5. Melt the candy bark according to package directions. Dip each coated brownie bite into the chocolate mixture, allowing excess to drip off. Repeat with remaining brownie bites until all have been dipped. 6. 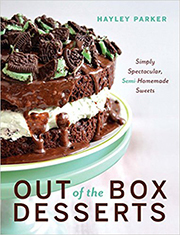 Brownie bites will keep, stored airtight at room temperature, for 2-3 days. 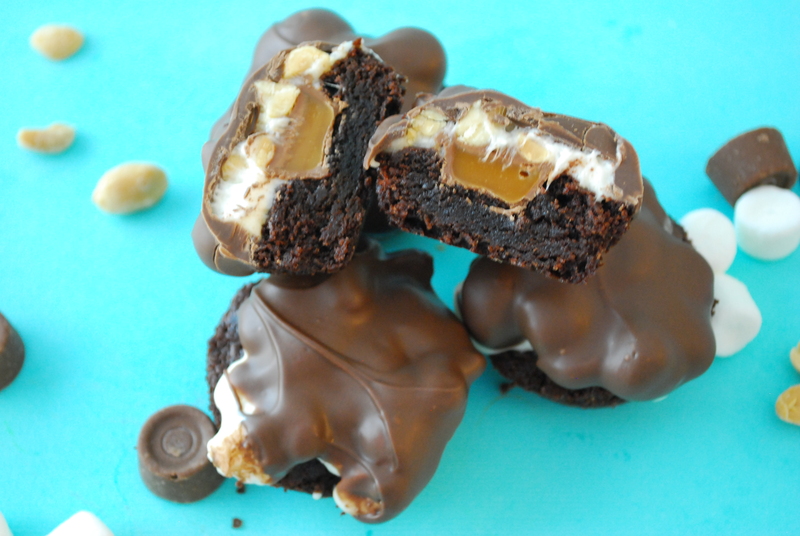 I love the sweetness from the marshmallow and brownies but the saltiness from the caramel and peanuts. No wonder it’s a Southern favorite–they’re freaking awesome. However, in bite-sized brownie form? They’re freaking dangerous. Hayley, way to go!!!! These look so good, love that little bit of Rolo right in the center! I’d like to think of myself as cultured, but I’m not. Not a world traveller. I live a family of world travelers, but I prefer to live in a bubble. Lol, Tanya I feel the same way! If someone gave me a plane ticket and hotel to Paris tomorrow, I’d take it… but otherwise, saving up for that kind of stuff is daunting, and honestly, I need shoes and an 89th rubber spatula and cannot fathom saving the $$. GooGoo clusters – yes! Wow, havent had one in about 20 years! 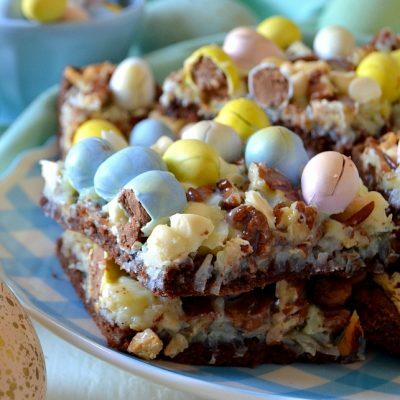 These look awesome b/c anything with brownies + Rolos is automatically stellar! I can’t believe I’d never had one before a couple months ago! So amazing! Yum!!! Never been to Cali myself, been to Nevada. That’s as far West as I’ve gone. Though if you want good BBQ, please come to Kansas City instead. See the fountains, enjoy some jazz, find the cow statues 😉 and enjoy some good classic and fabulous BBQ at Gates. Best place in town. Holy cow, thanks Sarah! Now I really want some BBQ!! Omg I’ve never heard of a goo goo cluster before! And when you visit New Orleans, bring me with you because anything with live bands and GUMBO (!!!!!) is totally up my alley! LOVE these gooey little buggers!!!! We should totally meet up there! I am DYING to go–I’m pretty sure I’ll enter (and win) a gumbo eating challenge because I love it SO much! Well, I’ve never been to Cali other than layovers a few times on our way to Hawaii. So I need to fix that soon. I’m just saying, knowing a plate of these was there waiting for me might hurry along the process 😉 yum yum! 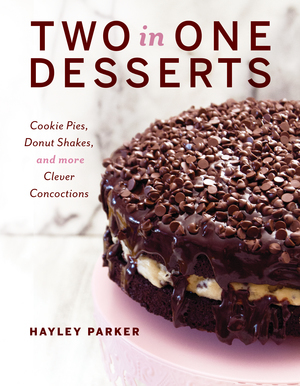 Holy crap Hayley, these look amazing. 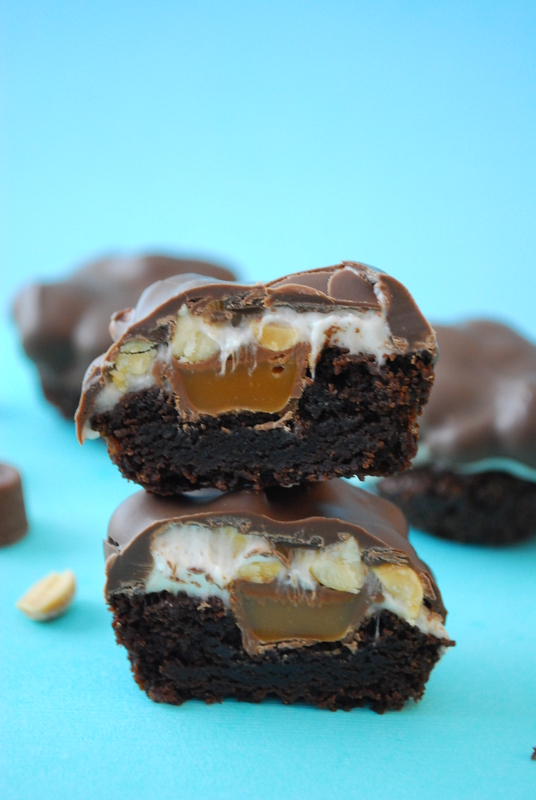 Love the photo with the rolo, mallows and peanuts oozing out. I just ate dinner but pass me a batch and I’ll entertain myself for quite some time! LOL. I’m with you on travelling. I hadn’t even been to London until 2 yrs ago, haha! My parents would always chose to spend their hard-earned money on normal vacas rather than thousands on a trip of a life. So I’ve only ever been to Spain, Turkey and Greece in my lifetime. Now that I’m older, I don’t have the money to travel, it’s so expensive so if I were to save money for a vaca, it’d have to be something ‘normal’ too. Although, the fella and I are desperate to travel to the US (we love motocross) and I’d have a ball in the cheaper than UK cake decorating stores. Oh yes! You should totally come to the US, Lisa! I could show ya around California pretty well 🙂 I’m dying to come to London–let’s swap houses, yeah?! Let’s eat our way around the world someday, mmkay? Because food from somewhere else is always better. Like, if it’s a bunch of these from your house it’s WAY better than if I make it. I’d like to join you on this eating trip. Being in Ohio though, I’ll grab JOcelyn and we’ll meet ya somewhere in the middle! Hayley, these brownie bites looks amazing! Yes please!! I am dying to meet y’all and I want to eat our way through whatever city we get together in! Ooooh, is that how it works? 😉 I hear ya, I definitely think we need to eat our way around the world! Mmmmmmmm……..Goo Goo Clusters are wonderful. I have one every so often. You’ve about got all our food groups down, now you just have to come visit – NOLA is a wonderful place – I’ve been several times. gumbo is great and the boys love my duck and sausage recipe but it’s so darn much work I only make it once a year. One day I hope to make it without having to make the roux twice because I scorched it the first time. These brownie bites look great and I think I should try them very soon! Yes, please try them soon! And if I’m ever in the South, pretty please make gumbo for me?! I will – even if it’s the dead of summer – it does taste wonderful! I have never had a goo-goo cluster, but if they taste anything like these look, I definitely need to try them! These are fabulous! Beth, that’s SO awesome! I am loving these GooGoo Clusters; they’re seriously amazing! And I would love to come to Nashville. There’s something so comforting about the city though I’ve never been. And obviously, they have amazing BBQ and candy 🙂 I’m there! Could you tell me approximately, how many did your recipe make? I would like to make these for the ladies at work and would want everyone to have at least 2 or 3 each…. smiling…. Hey Cheryl! These made approx. 24-28 brownie bites, depending on how much you fill your muffin tin with batter. It’s easily doubled or tripled! Hope the ladies at work enjoy!